Stephen H. Provost is a journalist and a fantasy novelist, but he is also what might be called a Historian of Fun. Stephen’s first history book, Fresno Growing Up: A City Comes of Age 1945-1985, chronicled the pop culture of California’s fifth-largest city: its bands, sports, fads, hangouts, restaurants, and notable personalities. Now Stephen is taking on a bigger project with his new book Highway 99: The History of California’s Main Street. 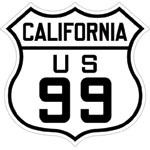 Highway 99 is an ambitious project, the definitive history of one of California’s most historic highways. But like Fresno Growing Up, Highway 99 is also a History of Fun—in this case the innumerable roadside attractions, diners, restaurants, motels, hotels, and theme parks that have lined old Highway 99. Illustrated with wonderful historic photographs, Highway 99 gives an authentic feel of what it was like to go out on a road trip in the days when Highway 99 drifted through the downtowns of every city in the state. Along the way, Highway 99 chronicles an amazing amount of history: the invention of basic highway equipment such as the center stripe and the road sign; the great Dust Bowl migrations of the Okies; the origins of California landmarks like Griffith Park and Magic Mountain; and the network of beacon towers for airplanes that briefly paralleled the highway in the 1920s; and numerous other fun and fascinating stories. Get your copy of Highway 99 here!